Well, at least be aware of them. Read on to understand. One of the pleasures of writing books on different topics (or at least different within the field of project management) is to find unusual connections between them. I recently had the pleasure of collaborating with Loredana Abramo, PMP on the new book, Bridging the PM Competency Gap. One of the things on which we focus in this book is the role that generational differences plays in the way that people gain knowledge. 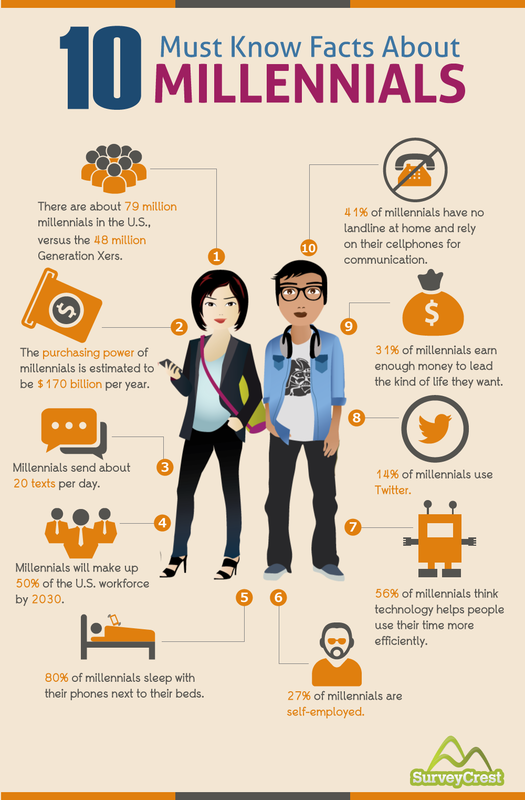 In turn, this required us to dig in and find out what drives Millennials. In one of the tables of the book, we look at Motivating and Enabling Factors, Deterring and Blocking Factors, and Engagement Strategies. One of the Motivating Factors was ‘strong ethical leaders’. And that is the connection from the Bridging the Gap book to the books on sustainability in PM (Green Project Management and Driving Project, Program, and Portfolio Success) and indeed to this blog. Today’s post is about how Millennials are driving change to the way that wealth is invested, with their propensity to insist that ethics, and along with it, social, economic, and ecological bottom lines are considered and balanced. By the way, let’s not ignore Millennials. Why? Their spending power is estimated at US$170B per year. I highly recommend that you spend a moment looking at this infographic (in small form here, linked to a larger size image for your convenience). This is why a small story in The Economist’s most recent issue caught my eye. It’s called Generation SRI and the subtitle is “Sustainable Investing Joins the Mainstream”. SRI is “Socially Responsible Investing”. Fans of “socially responsible investment” (SRI) hope that millennials, the generation born in the 1980s and 1990s, will drag these concepts into the investment mainstream. SRI is a broad-brush term, that can be used to cover everything from divestment from companies seen as doing harm, to limiting investment to companies that do measurable good (impact investing). The US Forum for Sustainable and Responsible Investment, a lobby group, estimates that more than a fifth ($8.7trn) of the funds under professional management in America is screened on SRI criteria, broadly defined, up from a ninth in 2012 (see chart). According to a survey in America by Morgan Stanley, 75% (of Millennials) agreed that their investments could influence climate change, compared with 58% of the overall population. They not only believe in the triple bottom line, they have confidence that they can be change agents. They are also twice as likely as investors in general to check product packaging or invest in companies that espouse social or environmental objectives. The Economist article cautions us that we can’t fool Millennials. They have too much savvy, and their’s too much data available to them (and they know how to use it) to ‘greenwash’ this group. From the article: “money managers who pay only lip-service to SRI are unlikely to get away with it for long: sooner or later the robots and millennials are bound to call them out”. And there is the rationale for the title of this blog post. Let’s get back to the Morgan Stanley survey. “As widespread attention to sustainability continues to increase, consumers and investors alike are now more than ever factoring sustainability issues into their investment decisions,” said Audrey Choi, Chief Sustainability Officer and Chief Marketing Officer at Morgan Stanley. Because it’s important for us as project managers – with an increasing number of Millennial stakeholders – to understand this generation, we provide this extract from the survey. Note the connection to long-term thinking. • Values Matter. Consciousness around sustainability has leapt from the consumer space to the investment space. According to the latest survey, investor attention to sustainability factors is now growing faster than that of consumers as a whole. • Environmental impact. Increased interest in sustainable investing occurred despite a heightened sense of market volatility, implying perhaps that in uncertain times, companies and funds with sustainable attributes may be viewed as more stable over the long run. 71% of investors polled agreed that good social, environmental and governance practices can potentially lead to higher profitability and may be better long-term investments. • Focus on Customization. The poll showed a strong desire for the ability to customize sustainable investments; 80% of individual investors and 89% of Millennials are interested in sustainable investments that can be customized to meet their interests and goals. • Sustainable Investing in the Workplace. With Millennials projected to make up 75% of the American workforce by 2025, it’s interesting to note that nine out of ten Millennial investors (90%) expressed interest in pursuing sustainable investments as part of their 401(k) portfolios. This implies that offering sustainable investment funds as 401(k) options may be an additional way for companies to attract and retain Millennial talent in competitive job markets. • Influence. 75% agree that it is possible for “my investment decisions to influence the amount of climate change caused by human activities," compared with 58% of the total individual investor population. • Impact. 84% agree that it is possible for “my investment decisions to create economic growth that lifts people out of poverty," compared with 79% of the total individual investor population surveyed. In summary, you get a feel here for the mindset of these Millennial investors, who are also project sponsors, team members, leaders, and customers. What does this mean to project managers? Well, if investors, who are (or should be) long-term thinkers are increasingly thinking about long-term impact, and projects are launched by investors, then by the tried and true property of transitivity, project managers should be thinking about long-term impacts as well – thinking through the project’s outcome to the benefits – and other side-effects of the project’s product in the long-term. In Part 2, I’ll discuss the particular ‘outcome areas’ that are the focus of sustainable investment, and how you can use this information to (A) make better decisions on your own project that serve the longer term, and (B) better understand the thinking behind the investment choices made by Millennials. Although the title of this post might make you think this is some strange cross between Star Wars and the video game series by Sega, instead it’s a different sort of combination, mainly coming from a great NPR podcast called “Hidden Brain” by Shankar Vedantam and a book called Expert Political Judgement by Philip Tetlock. As a matter of fact, the title of this post is literally one of the chapters in Tetlock’s book. The Hidden Brain podcast episode, which turns out to be about transgender surgery, starts off by mentioning a metaphor about the fox and the hedgehog, originated by Greek philosopher Archilochus and popularized by philosopher Isaac Berlin. In the story – and the essay from Berlin, hedgehogs view the world through the lens of a single, powerful, overarching, defining idea – in their case, “DO NOT GET EATEN” – and do so by rolling up into a spine-covered ball, and foxes, who draw on a wide variety of tactics to hunt a variety of prey. Foxes are flexible and clever and adaptable but often fail to ‘roll things up’ into single idea, and hedgehogs are steadfast and dependable and focused on a single end objective. In a normal project management blog, we could talk (productively) about how a PM has to be both – a sort of Hedgefox – which, by the way, is a real thing in the book by Tenlock. But no, this is no normal project management blog. It’s about the intersection of PM and long-term thinking, PM and the triple bottom line, PM and sustainability. So although a PM must be a fox in that he or she must be flexible and adaptable, and the PM must be a hedgehog in their focus on the end objective of the project, I am here to humbly and hedgehogly (an adjective I just invented) request that you add an additional dose of hedgehog to your PM genetic makeup. If you focus on the end objectives of the project, you are correctly satisfying the stakeholders’ requirements and that’s great. It’s what we do as PMs no matter what kind of animal we are. But the project’s product (and by this I mean physical product or new service) in its steady state, has characteristics that differ from the product at its ‘ribbon-cutting ceremony’. For example, a new factory may be ‘a success’, but if it produces pollutants into the local water table, it’s not really successful in the long term, is it? As a PM, are you focused only on the ‘ribbon-cutting ceremony’? How foxy of you. But that’s not good enough, not by a longshot and certainly not in the long-term. You need to have a single-minded idea of sustainability in your own PM planning toolbox. Think as a hedgehog – with the big, overarching idea of long-lasting success, not just in social and ecological benefits but also in terms of economic success. Is the ‘product of the project’ going to realize benefits for your organization for a long time? If so, congratulations! You have out-foxed the fox, or perhaps more properly stated, you have out-hedgehogged the fox. There, see? Now I invented a new verb! One way to amp-up your inner hedgehog is to include sustainability-oriented statements in the project’s Charter and to carry that forward on your little spiky back to the Stakeholder and Risk Registers. Have you considered stakeholders who will only come into the picture 3 years down the road? Have you considered threats and opportunities that have to do with the operation of your project’s product, and not just the product itself? These are little hedgehog tricks that can serve you (and your organization … and your planet) well. NOTE: I highly recommend the Hidden Brain podcast for project managers, whether you are interested in sustainability or not. The guests are interesting, the stories are assembled nicely, and most importantly, they make you think about the way you think about the way you think. Three pioneers in PM and Sustainability have published a survey of over 200 project managers, called "The Voice of Sustainability Project Managers" and I’d like to share some highlights with you and even offer some partial answers to the challenges they identified in their analysis. In order to keep this posting brief and to-the-point, I am going to quote their central findings and identified challenges below, and then invite you to look at the data in detail by clicking on the link above (or right here). Then, I’d like to have you see some of the ideas that I have in response to the challenges – because in our books Green Project Management and the follow-up Driving Project, Program, and Portfolio Success – The Sustainability Wheel, we clearly are of the same mind as the authors of the survey (as well as at least some of the participants). The central finding of this report is that organizations have adopted Sustainability strategically and are executing Sustainability initiatives, but their project managers do not have the resources they need to competently manage this process. Their challenges range from project methodology gaps to specific needs in achieving organizational change. Our survey results indicate that 50% of organizations have their Sustainability program to a point that is consistent with a Triple Bottom Line (TBL) approach. Survey results suggest that the project management community is increasingly viewing Sustainability as relevant to their organization with 86% of respondents indicating that their organizations engage in some kind of Sustainability activities. The large percentage of respondents reporting that their organizations are on the Sustainability Continuum suggests that incorporating Sustainability into organizational strategy is a priority for senior management. This finding is not exclusive to this report. From a program and project management perspective, 69% indicate that their role is related either directly or indirectly to Sustainability but that incorporating Sustainability into projects remains a challenge. Respondents affirm that their roles as PMs are increasingly related to Sustainability and that more than 60% have professional experience working in the field of sustainability. Yet, most respondents felt that there are significant barriers in working with Sustainability projects especially from lack of strategic planning and coordination, weak organizational support, and lack of training. With respect to project management, respondents are seeking a better understanding of how to integrate sustainability into project management, especially around developing a culture of sustainability, engaging stakeholders and change management. Identify the mission statement of your own organization and use that to assure linkages to your project for decision making that reflects what your senior managers are thinking (as shown in the survey – they are thinking about sustainability). What does YOUR voice say on this topic? In Part I of this series, we discussed the Signal Crayfish and its human-led introduction into Crater Lake – originally as fish food for Crater Lake’s (also human-introduced fish for humans to fish for sport), and the problems that the Signal Crayfish is now causing for a rare newt only found in Crater Lake. So in that story, the Crayfish is the villain, or appears to be. Certainly, it is a story fraught with lessons for project managers – unintended consequences (threats), stakeholder management, and also fraught with science lessons (climate change induced temperature rise at the root of the issue). But now we move on to Part II, in which the crustacean is not the villain, but the hero. Sort of. "Tiny, transparent, and threatened, krill are crucial to the Antarctic ecosystem. But the population of krill is crashing for reasons that continue to baffle the experts. A leading theory says that krill’s life cycle is driven by an internal body clock that responds to the waxing and waning of the Antarctic ice pack, and as climate change alters the timing of the ice pack, their life cycle is disrupted. To test it, NOVA travels on the Polarstern, a state-of-the-art research vessel, to the frigid ice pack in the dead of winter. From camps established on the ice, scientists dive beneath the surface in search of the ice caves that shelter juvenile krill during the winter. There, they hope to discover what’s causing the krill to vanish and, ultimately, how the shifting seasons caused by climate change could disrupt ecosystems around the world." • What’s causing the krill to vanish? • Is this indicative of a larger problem? • Is this indicative of a need for more projects to better understand how climate is changing? • Will these projects need project managers? Now don't get us wrong, we still think that you should watch the video. But [SPOILER ALERT] we’ll give you the spoiler right here. There are a few elements of climate change that are causing the decline in krill population. The krill need to eat after they hatch – a critical time in their development. They eat phytoplankton. The lack of a fully frozen ocean area stops the collection of phytoplankton (which the krill eat) and its preservation until summer. In the show they call this the shrinking of “the giant phytoplankton Popsicle”. Also, it appears that the change in sea ice patterns, caused by climate change, is affecting the krill’s circadian rhythms. The krill need to eat after they hatch – a critical time in their development. They eat phytoplankton. In fact many organisms in this Antarctic region are very “hard wired” to particular patterns of melting and re-freezing and even slight changes to those patterns can cause huge problems for them all. For those who are interested in further understanding how krill can be considered a bellwether for the effects of climate change, check out this link from National Geographic magazine. • The temperature in this region of the world (Antarctica, see photo below) has risen 7 degrees C (11-12 degrees F) in the last 50 years – that’s 5 times the global average temperature change. So the changes are magnified here, and to me that means the ‘early warning signs’ can be better measured here. • Winter season has shrunk by 90 days. All of these things are contributing to the krill population decline. And that’s important because of the food web’s dependency on the krill (see figure). The program ends with one particularly heavy question. They say that the krill will find it exceedingly difficult to change their behavior – can we change ours? This is a two-part story. In Part I, the crustacean is the villain. In Part II, the crustacean is the hero. Or… maybe it’s not so cut-and-dry. In any case, it is a two part story, and, as Yoda might say: “Read it, you can - learn from it you must”. Just like in project management, stakeholders can be on either side of a project issue. Or, more interestingly, they can be on BOTH sides of a project issue. Our story unfolds at Crater Lake. Crater Lake is a unique environment in south-central Oregon. It’s known for its natural beauty and crystal clear, deep blue water. In the story you’ll find in this video, you’ll see that a series of decisions to attempt to preserve the environment of Crater Lake has led to some problems, one which threatens the existence of a critter that lives ONLY here – the Mazama Newt. That’s correct; this is the only place on the planet that you will find that species. Until the introduction of the Signal Crayfish (see feature photo above), the Mazama newt thrived here. And actually, the Signal Crayfish population was under control until suspected climate change effects have increased the temperature of the water by several degrees Fahrenheit. Now, the newt is on the run. Please watch this short video so that you can get the most out of this post. The issue has launched several research projects and will likely launch one or more rescue projects as a result. These are green-by-definition projects (as discussed in both of our books) which are aimed at reacting to a realized threat which in turn is a result of a risk response from an earlier project. Over the past century, crayfish — aka crawfish, crawdads, or, if you study invasive species, “aquatic cockroaches” — have colonized lakes and streams from California to Taipei. In some places, as in Crater Lake, they were introduced deliberately to control weeds or feed fish; in others, they arrived accidentally as bait. They are, in many respects, the perfect invader: hardy, omnivorous, aggressive. “They have those big claws, and they’re really good at essentially brutalizing other animals,” says Jake Vander Zanden, a professor at the University of Wisconsin-Madison who has waged war against crayfish in midwestern lakes. You don’t need to be an ecologist to guess what happened once the disastrous decapods arrived at Crater. The fish didn’t eat them, and all but two species (rainbow trout and kokanee salmon) eventually perished. The crayfish, meanwhile, persisted in the lake at low levels until the 1990s, when populations exploded — perhaps thanks to climate change, which may have warmed Crater Lake’s waters enough to stimulate rapid breeding. As the crustaceans boomed, they devastated aquatic invertebrates, like worms and midges, which plummeted by nearly 80 percent in infested areas. So now the hunted have become the hunter. And they are also displacing and greatly endangering the Mazama Newt – which as you learned earlier are only found a this one location on the planet. We see the effect here – on the environment, and on projects – from a very slight change in climate. In a way, this could be a ‘canary in a coal mine’ signal advising us of further potential problems, an early warning sign of other threats to be triggered by climate change, and of course projects to be launched to remediate them. The immediate threat is the possible elimination of the Mazama newt by the Signal Crayfish. With all this talk of triggers and early warning signs, this could be a story about monitoring and controlling risks and issues. And it is, but it’s not the main spin of the story from our perspective. So this is a lesson about the environment. And you can take significant value in the learning derived from the environmental piece. But there is a takeaway for project managers as well. This is where this blog lives – right at that intersection. Is the crayfish truly a villain? It is doing what we expect it to do in its environment. It’s the environment that changed. So as a project manager, if we look not only at power and attitude, but also interests, we know that the stakeholder will behave in its best interests – and that changes depending on the environment. In this case, the environment changes such that it continues to maintain its interests, but its power goes significantly up as it seeks to follow its interests. In your projects, look for the ‘signal crayfish’ out there – those whose power may go way up due to a changing environment. It doesn’t only happen in Crater Lake – it can happen on a new app development project just as easily. The larger issue is the climate change indicated by the temperature rise in Crater Lake. Let’s move on to another story in which the crustacean is no longer a villain, but a victim – even a hero.